Normalizes, reduces sputum viscosity and facilitates its excretion for all types of “wet coughs” 1. Composition: 1 ml of the solution contains carbocisteine 50 mg and other excipients. Langes does not contain any colourants – minimal risk of developing allergic reactions. Langes is a carbocisteine: QUICK2. EFFICIENT. FOR THE WHOLE FAMILY3. 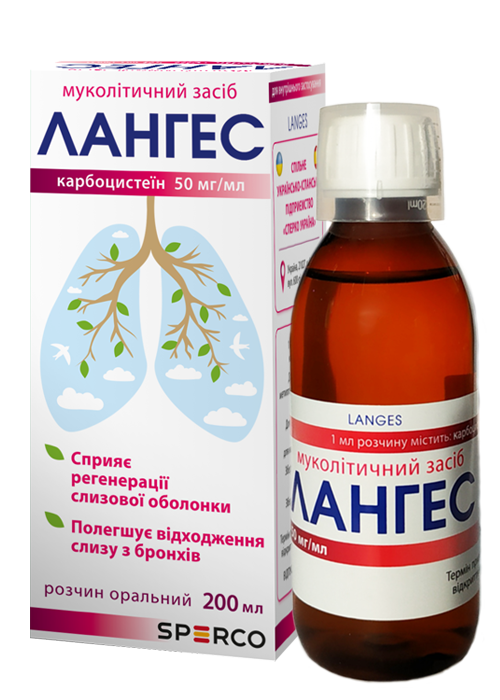 Langes is used to treat all types of “wet cough1”, whether or not it is easier or more difficult to expel the sputum. Langes is carbocisteine in the form of solution. Langes thanks to carbocisteine properties has double mechanism of action – influencing the sputum as mucolytic, and the place of its production – as mucoregulator. normalizes sputum viscosity, loosens viscous mucus and expels it. ensures restoration of bronchial mucous membrane by normalizing its structure, reducing hyperplasia of goblet cells (which produce mucus) thus decreasing excessive sputum production. restores viscosity and elasticity of the sputum. facilitates improvement of mucociliary clearance and quick expectoration. Langes – maximally quick2 reduces sputum viscosity and facilitates its excretion; maximum concentration in blood plasma is achieved within 2 hours. Langes – cost-effective. Shelf life after first opening: 12 months. Langes – FOR THE WHOLE FAMILY3. Adults – 200 ml. Children older than 2 years of age – 60 ml. Children 15 years of age and older – 15 ml of solution three times a day. For detailed information on the medicinal product Langes, please see “Package leaflet” page. 1 “wet cough” shall be understood to mean symptoms of impairment of bronchial secretion and sputum excretion. 2the word “quick” shall be understood to mean a quick absorption of the active ingredient in the gastrointestinal tract. 3In accordance with the approved indications for use, contradictions and special indications specified in the Package leaflet.